Ronald W Hunt of Mesa, Arizona passed away on September 7, 2016 at the age of 74. Ron was born on March 16, 1942 to John and Mathilda in Phoenix, Arizona. He served an LDS mission in the Eastern States as a young man. In 1966 he was sealed to his beloved wife of 50 years, Jeanne (Pace), in the Mesa, Arizona Temple. Ron and Jeanne were blessed with four children Stacey (Jim Ball), Tim (Nancy), Crystal (Matthew Brown) and Bryan (Sarah) and 19 grandchildren. Ron received his bachelor’s degree from Brigham Young University and his master’s degree from Arizona State University. Ron was a coach and P.E. teacher for nearly 40 years in the Mesa Public Schools District (Mesa Jr. High, Dobson and Mesa High School). Friday nights were a big deal at the Hunt home for many years. 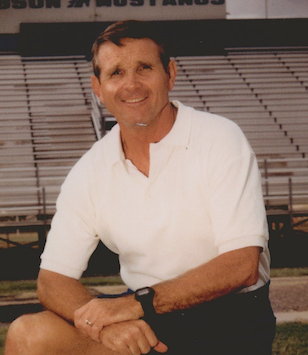 Ron forged lifetime friendships with the coaches he worked with and influenced hundreds of young men throughout the years to be the very best they could be both on and off the field. After retiring, Ron served a mission with Jeanne in the Washington D.C. temple. Ron really enjoyed fishing and loved spending time with his family. He was preceded in death by his mother and father, his brother Elwood and is survived by his sister, Barbara Johnston (Ken) and Rosemary (Elwood’s wife). A celebration of his life will be held at the Mesa East Stake Center at 2228 E Brown Road, Mesa, on Saturday, September 17, 2016 at 10:00 AM. Bunker’s Garden Chapel is handling the arrangements. Coach Hunt was my PE teacher MANY years ago at Mesa Jr. High School. He treated his boys with respect but had high expectations of how we should act. He taught by example. What a great man. Jeanne and family so sorry for your loss may God bless and comfort you through this time. Love your family our prayers are with you. Joe & Shirley, Our love remains ever so strong for Ron and his family. We pray for Jeannie and the family with love and tenderness always. Ron will always be remembered as one of the most unselfish people in my life. He was an excellent coach and teacher and also an excellent fisherman. Ron was like a brother to me. He was one of the most unselfish men I have ever teamed up with in this life time. He was an excellent coach and teacher and one of the best fishermen in the area. A great fisherman to be in the boat with. I taught with Ron at Mesa Junior High many years ago. Ron is a very good man and an excellent teacher and coach. My son, Stephen, played football for him at MJHS and has nothing but praise for him as a man and as a coach. We send our good feelings to his family, knowing this separation is but temporary. I’m very sorry for your loss. It’s my hope that you can draw comfort and strength from Jehovah God’s promises in the Bible. At Revelation 21:3,4 and John 5:28,29 He promises that there will soon be a time when there will be no more pain, sickness, or death, and we can see the loved ones we have lost again. Please accept my deepest condolences.